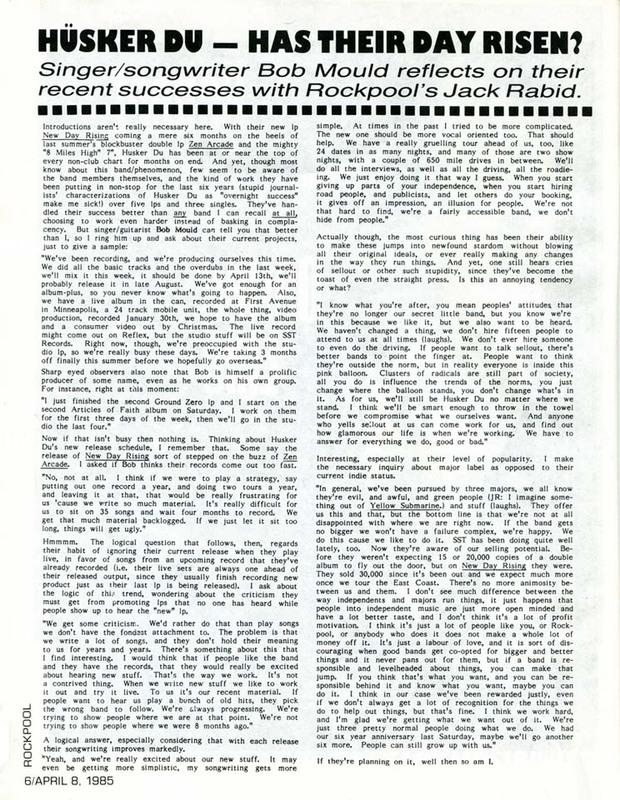 The NYC-based Rockpool newsletter was around in the 1980s and early 90s, and appears to have been aimed at DJs. The 08 Apr 1985 issue (Vol. 5, #6) featured an interview with Bob Mould conducted by Jack Rabid (moonlighting from his own magazine, The Big Takeover). 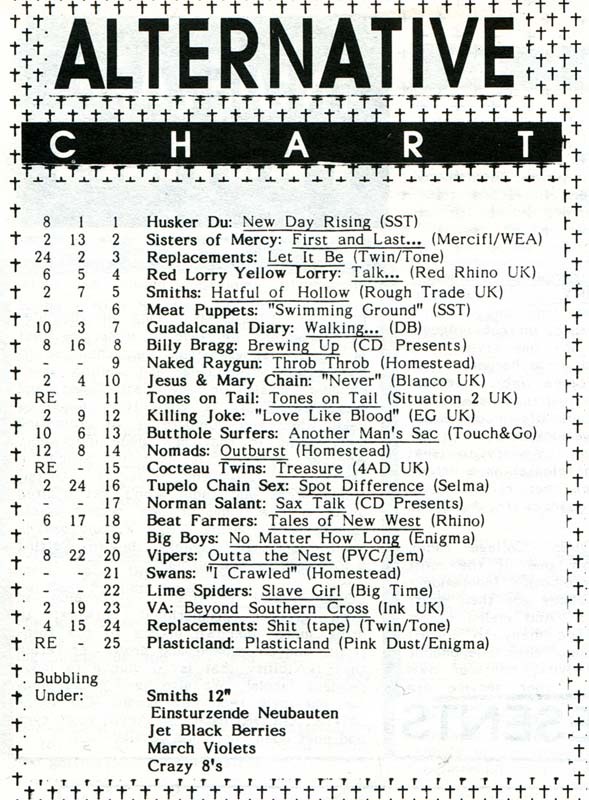 The "Alternative" Music Chart listing New Day Rising at #1 appeared in the same issue. A text transcription of the interview page follows the images. HÜSKER DÜ  HAS THEIR DAY RISEN? "We've been recording, and we're producing ourselves this time. We did all the basic tracks and the overdubs in the last week, we'll mix it this week, it should be done by April 13th, we'll probably release it in late August.1 We've got enough for an album plus, so you never know what's going to happen. Also, we have a live album in the can, recorded at First Avenue in Minneapolis, a 24 track mobile unit, the whole thing, video production, recorded January 30th, we hope to have the album and a consumer video out by Christmas.2 The live record might come out on Reflex, but the studio stuff will be on SST Records. Right now, though, we're preoccupied with the studio lp, so we're really busy these days. We're taking 3 months off finally this summer before we hopefully go overseas." "I just finished the second Ground Zero lp and I start on the second Articles of Faith album on Saturday. I work on them for the first three days of the week, then we'll go into the studio the last four." Now if that isn't busy then nothing is. Thinking about Husker Du's new release schedule, I remember that. Some say the release of New Day Rising sort of stepped on the buzz of Zen Arcade. I asked if Bob thinks their records came out too fast. "No, not at all. I think if we were to play a strategy, say putting out one record a year, and doing two tours a year, and leaving it at that, that would be really frustrating for us 'cause we write so much material. It's really difficult for us to sit on 35 songs and wait four months to record. We get that much material backlogged. If we just let it sit too long, things will get ugly." Hmmmm. The logical question that follows, then, regards their habit of ignoring their current release when they play live, in favor of songs from an upcoming record that they've already recorded (i.e. their live sets are always one ahead of their released output, since they usually finish recording new product just as their last lp is being released). I ask about the logic of this trend, wondering about the criticism they must get from promoting lps that no one has heard while people show up to hear the "new" lp. "We get some criticism. We'd rather do that than play songs we don't have the fondest attachment to. The problem is that we write a lot of songs, and they don't hold their meaning to us for years and years. There's something about this that I find interesting. I would think that if people like the band and they have the records, that they would really be excited about hearing new stuff. That's the way we work. It's not a contrived thing. When we write new stuff we like to work it out and try it live. To us it's our recent material. If people want to hear us play a bunch of old hits, they pick the wrong band to follow. We're always progressing. We're not trying to show people where we were 8 months ago." A logical answer, especially considering that with each release their songwriting improves markedly. "Yeah, and we're really excited about our new stuff. It may even be getting more simplistic, my songwriting gets more simple. At times in the past I tried to be more complicated. The new one should be more vocal oriented too. That should help. We really have a gruelling tour ahead of us, too, like 24 dates in as many nights, and many of those are two show nights, with a couple of 650 mile drives in between.3 We'll do all the interviews, as well as all the driving, all the roadieing. We just enjoy doing it that way I guess. When you start giving up parts of your independence, when you start hiring road people, and publicists, and let others do your booking, it gives off an impression, an illusion for people. We're not that hard to find, we're a fairly accessible band, we don't hide from people." Actually though, the most curious thing has been their ability to make these jumps into newfound stardom without blowing all their original ideals, or ever really making any changes in the way they run things. And yet, one still hears cries of sellout or other such stupidity, since they've become the toast of even the straight press. Is this an annoying tendency or what? "I now what you're after, you mean peoples' attitudes that they're no longer our secret little band, but you know we're in this because we like it, but we also want to be heard. We haven't changed a thing, we don't hire fifteen people to attend to us at all times (laughs). We don't ever hire someone to even do the driving. If people want to talk sellout, there's better bands to point the finger at. People want to think they're outside the norm, but in reality everyone is inside this pink balloon. Clusters of radicals are still part of society, all you do is influence the trends of the norms, you just change where the balloon stands, you don't change what's in it. 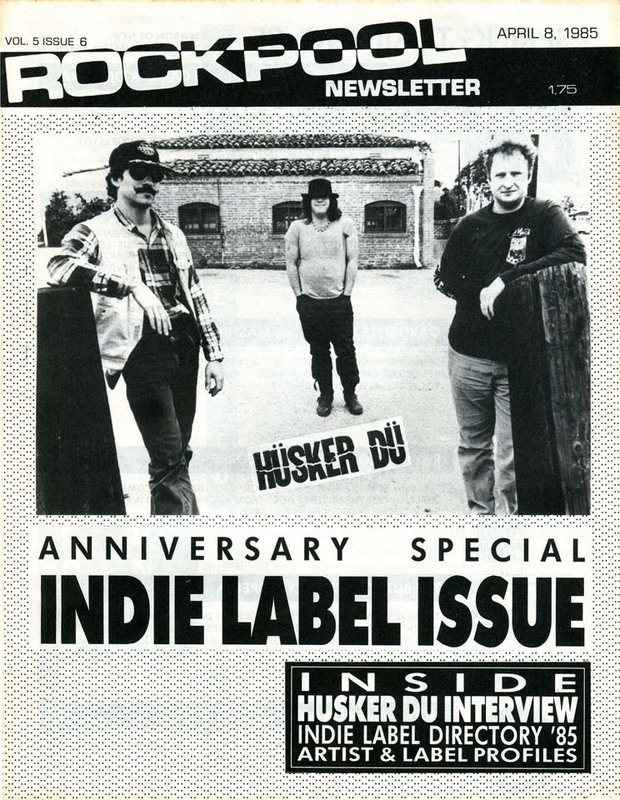 As for us we'll still be Husker Du no matter where we stand. I think we'll be smart enough to throw in the towel before we compromise what we ourselves want. And anyone who yells sellout at us can come work for us, and find out how glamorous our life is when we're working. We have to answer for everything we do, good or bad." Interesting, especially at their level of popularity. I make the necessary inquiry about major label as opposed to their current indie status. "In general, we've been pursued by three majors, we all know they're evil, and awful, and green people (JR: I imagine something out of Yellow Submarine.) and stuff (laughs). They offer us this and that, but the bottom line is that we're not at all disappointed with where we are right now. If the band gets no bigger we won't have a failure complex, we're happy. We do this cause we like to do it. SST has been doing quite well lately, too. Now they're aware of our selling potential. Before they weren't expecting 15 or 20,000 copies of a double album to fly out the door, but on New Day Rising they were. They sold 30,000 since it's been out and we expect much more once we tour the East Coast. There's no more animosity between us and them. I don't see much difference between the way independents and majors run things, it just happens that people into independent music are just more open minded and have a lot better taste, and I don't think there's a lot of profit motivation. I think it's just a lot of people like you, or Rockpool, or anybody who does it does not make a whole lot of money off it. It's just a labour of love, and it is sort of discouraging when good bands get co-opted for bigger and better things and it never pans out for them, but if a band is responsible and levelheaded about things, you can make that jump. If you think that's waht you want, and you can be responsible behind it and know what you want, maybe you can do it. I think in our case we've been rewarded justly, even if we don't always get a lot of recognition for the things we do to help out thngs, but that's fine. I think we work hard, and I'm glad we're getting what we want out of it. We're just three pretty normal people doing what we do. We had our six year anniversary last Saturday, maybe we'll go another six more. People can still grow with us." If they're planning on it, well then so am I. 1. The project to which Bob refers would ultimately yield the Flip Your Wig album and the Makes No Sense At All 7". 2. The live recording of the 30 Jan 1985 show at 1st Ave in Minneapolis was never released, but two video tracks appeared on the It's Clean, It Just Looks Dirty video compilation; an audio track turned up as a B-side, and another was included on an NME freebie 7". As of 2017, Numero Group was in possession of the 24-track master tape Bob mentions. 3. This spring 1985 tour stretch would prove to be even more insane than Bob's projection, as the band scrubbed a couple of East Coast dates to play a gig in London on 14 May 1985, then flew back to resume the tour schedule the next night in Cleveland.